Piper Down is one of Salt Lake City’s premier Irish Pubs and live music venues near downtown offering Karaoke, Swing Dance Nights, live bands, Bingo and Texas Holdem Poker. David and Shelli were first inspired to open a Pub while Honeymooning in Temple Bar District of Dublin, Ireland. After much effort they finally found a space that would make their dream a reality. 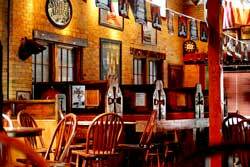 Dave and Shelli bought the building at 1492 South State in Salt Lake City in September of 2002 following preliminary approval from the City to transform the vacant Constable’s office into “The Temple Bar an Olde World Pub”. What followed was 14 public hearings, appeals and endless red tape, mostly due to the misconception that the name was meant to slight the LDS Church. To avoid further delays, they changed the name to “Piper Down an Olde World Pub”. Their hands were still tied until they finally won their permit to begin work in January 2003. Click Drag & Drop Gold Person Icon for 3D Photo view. It’s Fun!